I am not sure, if I am just losing steam on the Temeraire books or the series is just starting to drag. I had purposefully read several books between Black Powder War, because I had this same feeling after the third Temeraire book. Apparently, it has not been enough time. 1. Temeraire and Laurence visited a new place! I really enjoy reading about how dragons live in different parts of the world. I really appreciate it when authors' world building includes different cultures. It gives you an idea of the diversity of the world. 2. I feel that the characters appear to be growing as individuals. Temeraire is not the same little dragon that we met in His Majesty's Dragon. 1. Although I am sure that other people like this, I do not care for all the books reading into one another. The plot of the last book slammed into the beginning of this book, and the end of this book most likely slams into the beginning of the next one. I prefer a little bit of time between books. It feels like all these books were supposed to be one long book, but the editors split them. They lose the sense of individuality. 2. Maybe because my attention was waning in this one, but I don't feel Temeraire talked as much in this one. And I need to be honest, I read the books for Temeraire, not Laurence (who is a bit of a stick in the mud). 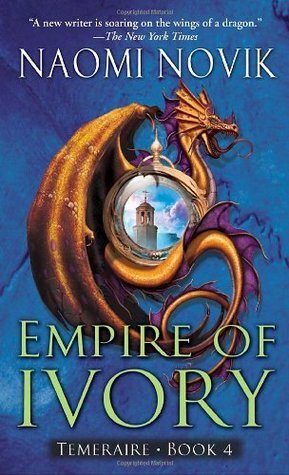 Sign into Goodreads to see if any of your friends have read Empire of Ivory. 76.0% "When I get pregnant, I am referring to my baby as my egg. #likeadragon"